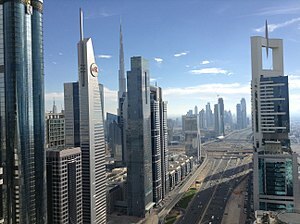 The economy of the United Arab Emirates is the second largest in the Middle East (after Saudi Arabia), with a gross domestic product (GDP) of $403.2 billion (AED 1.46 trillion) in 2014. The Emirates have been successfully diversifying their economy. Although the UAE has the most diversified economy in the GCC, its economy remains extremely reliant on petroleum (oil). With the exception of Dubai, most of the UAE is dependent on oil revenues. Petroleum and natural gas continue to play a central role in the economy, especially in Abu Dhabi. More than 85% of the UAE's economy was based on the oil exports in 2009. While Abu Dhabi and other UAE emirates have remained relatively conservative in their approach to diversification, Dubai, which has far smaller oil reserves, was bolder in its diversification policy. In 2011, oil exports accounted for 77% of the UAE's state budget. Tourism is one of the bigger non-oil sources of revenue in the UAE, with some of the world's most luxurious hotels being based in the UAE. A massive construction boom, an expanding manufacturing base, and a thriving services sector are helping the UAE diversify its economy. Nationwide, there is currently $350 billion worth of active construction projects. The UAE is a member of the World Trade Organization and OPEC. 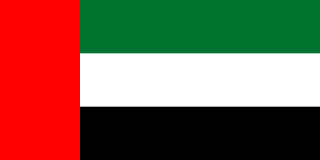 Prior to independence from the UK and unification in 1971, each emirate was responsible for its own economy. At the time, pearl diving, seafaring and fishing were together the mainstay of the economy, until the development of Japanese cultured pearls and the discovery of commercial quantities of oil. Previous UAE President Zayed Bin Sultan Al Nahyan is credited with bringing the country forward into the 20th century and using the revenue from oil exports to fund all the necessary development. Likewise, former UAE vice-president Rashid Bin Saeed Al Maktoum had a bold vision for the Emirate of Dubai and foresaw the future in not petroleum alone, but also other industries. In the 1980s Dubai's diversification centred around trade and the creation of shipping and logistics centres, notably Port Rashid and the port and Free Zone of Jebel Ali as well as Dubai International Airport, leading to a number of major global plays in shipping, transportation and logistics (DP World, Emirates, DNATA). The emergence of Dubai's lively real estate market was briefly checked by the global financial crisis of 2007-8, when Dubai was bailed out by Abu Dhabi. The recovery from the overheated market led to tighter regulation and oversight and a more realistic market for real estate throughout the UAE with many 'on hold' projects restarting. Although the market continues to expand, current market conditions for developers have been characterised as 'tough'. UAE has the second-largest economy in the Arab world (after Saudi Arabia), with a gross domestic product (GDP) of $377 billion (AED1.38 trillion) in 2012. A third of the GDP is from oil revenues. The economy was expected to grow 4–4.5% in 2013, compared to 2.3–3.5% over the previous five years. Since independence in 1971, UAE's economy has grown by nearly 231 times to AED1.45 trillion in 2013. The non-oil trade has grown to AED1.2 trillion, a growth of around 28 times from 1981 to 2012. The UAE's economy is one of the most open worldwide, and its history of economic history goes back to the times when ships sailed to India, along the Swahili coast, as far south as Mozambique. Current UAE's GDP is $386.4 Billion while the individual share is almost 70 thousand dollars. International Monetary Fund (IMF) expected UAE's economic growth to increase to 4.5% in 2015, compared to 4.3% in 2014. The IMF ascribed UAE's potentially strong economic growth in World Economic Outlook Report to the increased contribution of non-petroleum sectors, which registered a growth average of more than 6% in 2014 and 2015. Such contribution includes banking, tourism, commerce and real estate. Increase of Emirati purchasing power and governmental expenditures in infrastructure projects have considerably increased. Internationally, UAE is ranked among the top 20 for global service business, according to AT Kearney, the top 30 on the WEF “most-networked countries” and in the top quarter as a least corrupt country per the TI's corruption index. With imports totaling $273.5 billion in 2012, UAE passed Saudi Arabia as the largest consumer market in the region. Exports totaled $314 billion, which makes UAE the second largest exporter in the region. UAE and India are each other's main trading partners, with the latter having many of its citizens working and living in the former. The trade totals over $75 billion (AED275.25 billion). The top five of the Main Partner Countries of the UAE in 2014 are Iran (3.0%), India (2.9%), Saudi Arabia (1.5%), Oman (1.4%) and Switzerland (1.2%). As for the top five of UAE suppliers are China (7.4%), United States (6.4%), India (5.8%), Germany (3.9%) and Japan (3.5%). Dubai suffered from a significant economic crisis in 2007-2010 and was bailed out by Abu Dhabi's oil wealth. Dubai's current prosperity has been attributed to Abu Dhabi's petrodollars. In 2014, Dubai owed a total of $142 billion in debt. The UAE government has worked towards reducing the economy's dependence on oil exports by 2030. Various projects are underway to help achieve this, the most recent being the Khalifa Port, opened in the Emirate of Abu Dhabi at the end of 2012. The UAE has also won the right to host the World Expo 2020, which is believed to have a positive effect on future growth, although there are some skeptics which mention the opposite. Over the decades, the Emirate of Dubai has started to look for additional sources of revenue. High-class tourism and international finance continue to be developed. In line with this initiative, the Dubai International Financial Centre was announced, offering 55.5% foreign ownership, no withholding tax, freehold land and office space and a tailor-made financial regulatory system with laws taken from best practice in other leading financial centres like New York, London, Zürich and Singapore. A new stock market for regional companies and other initiatives were announced in DIFC. Dubai has also developed Internet and Media free zones, offering 100% foreign ownership, no tax office space for the world's leading ICT and media companies, with the latest communications infrastructure to service them. Many of the world's leading companies have now set up branch offices, and even changed headquarters to, there. 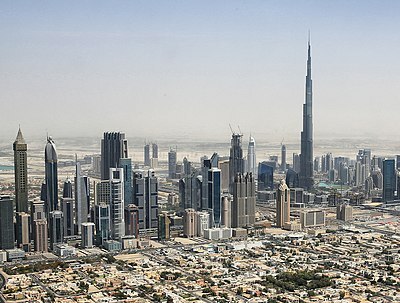 Recent liberalisation in the property market allowing non citizens to buy freehold land has resulted in a major boom in the construction and real estate sectors, with several signature developments such as the 2 Palm Islands, the World (archipelago), Dubai Marina, Jumeirah Lake Towers, and a number of other developments, offering villas and high rise apartments and office space. Emirates (part of the Emirates Group) was formed by the Dubai Government in the 1980s and is presently one of the few airlines to witness strong levels of growth. Emirates is also the largest operator of the Airbus A380 aircraft. As of 2001[update], budgeted government revenues were about AED 29.7 billion, and expenditures were about AED 22.9 billion.In addition, to finding new ways of sustaining the national economy, the UAE has also made progress in installing new, sustainable methods of generating electricity. This is evidenced by various solar energy initiatives at Masdar City and by other renewable energy developments in parts of the country. In addition, the UAE is starting to see the emergence of local manufacturing as new source of economic development, examples of significant government-led investments such as Strata in aerospace industry, under Mubadala are successful, while there are also small scale entrepreneurial ventures picking up, such as Zarooq Motors in the automotive industry. With reference to foreign trade, UAE's market is one of the world's most dynamic markets worldwide, placed among the 16 largest exporters and 20 largest importers of commodities. The top five of the Main Partner Countries of the UAE in 2014 are Iran (3.0%), India (2.9%), Saudi Arabia (1.5%), Oman (1.4%) and Switzerland (1.2%). As for the top five of UAE suppliers are China (7.4%), United States (6.4%), India (5.8%), Germany (3.9%) and Japan (3.5%). In 2014, the United Arab Emirates managed to export 380.4bn dominated by four products which are Petroleum oils and oils obtained from bituminous... (19.8%) Diamonds, whether or not worked, but not mounted... (3.4%) Gold, incl. gold plated with platinum, unwrought... (3.2%) Articles of jewellery and parts thereof, of...(2.8%). In the same year, the United Arab Emirates imported 298.6 bn dominated by five countries which are China (7.4%), United States (6.4%), India (5.8%), Germany (3.9%), Japan (3.5%). On one hand, the United Arab Emirates managed in 2013 to export 17 bn USD services exported in 2013 dominated by travel (67.13%), transportation (28.13%), Government services (4.74%). On the other hand, it imported 63.9 bn USD of services imported services dominated by transportation (70.68%), travel (27.70%) and government services (1.62%). Emiratisation is an initiative by the government of the UAE to employ more UAE Nationals in a meaningful and efficient manner in the public and private sectors. While the program has been in place for more than a decade and results can be seen in the public sector, the private sector is still lagging behind with citizens only representing 0.34% of the private sector workforce. While there is general agreement over the importance of Emiratisation for social, economic and political reasons, there is also some contention as to the impact of localization on organizational efficiency. It is yet unknown whether, and the extent to which, employment of nationals generates returns for MNEs operating in the Middle East. Recent research cautions that localization is not always advantageous for firms operating in the region, and its effectiveness depends on a number of contingent factors. In December 2009 however, a positive impact of UAE citizens in the workplace was identified in a newspaper article citing a yet unpublished study, this advantage being the use of networks within the evolving power structures. Overall, however, uptake in the private sector remains low regardless of significant investments in education, which have reached record levels with education now accounting for 22.5% – or $2.6 billion – of the overall budget planned for 2010. Multiple governmental initiatives are actively promoting Emiratisation by training anyone from highschool dropouts to graduates in a multitude of skills needed for the - essentially Western - work environment of the UAE, these initiatives include Tawteen UAE, ENDP or the Abu Dhabi Tawteen Council. There are very few anti-discrimination laws in relation to labour issues, with Emiratis – and other GCC nationals – being given preference when it comes to employment. Unions are generally banned and workers with any labour issues are advised to be in touch with the Ministry of Labour, instead of protesting or refusing to work. Migrant employees often complain of poor workplace safety and wages based on nationality, although this is being slowly addressed. Beyond directly sponsoring educational initiatives, the Emirates Foundation for Philanthropy is funding major research initiatives into Emiratisation through competitive research grants, allowing universities such as United Arab Emirates University or Dubai School of Government to build and disseminate expertise on the topic. Academics working on various aspects of Emiratisation include Paul Dyer and Natasha Ridge from Dubai School of Government, Ingo Forstenlechner from United Arab Emirates University, Kasim Randaree from the British University of Dubai and Paul Knoglinger from the FHWien. The stock market capitalisation of listed companies in the UAE was valued at $109.9 billion in October 2012 by Bloomberg. The Securities and Commodities Authority (SCA) introduced a new corporate governance regulation (the Corporate Governance Code), which applies to all joint stock companies and institutions whose securities are listed on Dubai Financial Market (DFM) and Abu Dhabi Securities Exchange (ADX) in 2009. The development in the real estate and infrastructure sectors during the recent year has contributed in making the country a global touristic destination. The contribution of tourism in the Emirati GDP increased from 3% in the mid-1990s to more than 16.5% by the end of 2010. This trend is supported by the huge public investments in touristic projects (47 Billion Dollars per annum) carried mainly to expend airports, increase their capacity, set up new airports and ports. The real estate sector have a positive impact on development, job opportunities, investments and tourism as estate projects were launched to meet the needs of market and the increasing demand for housing and commercial units especially in Dubai and Abu Dhabi. The UAE has 18 tour hotels out of the 155 (150 meters high) that exist around the world. This makes the UAE the third destination with such tours after China and America in 2014. These buildings are among the UAE's attractions for tourists. The leap in real estate sector along and infrastructure development in the UAE during the recent year has contributed in making this country a global touristic destination par excellence. Therefore, the contribution of tourism in the Emirati GDP increased from 3% in the mid-1990s to more than 16.5% by the end of 2010. This trend is supported by the huge public investments in touristic projects (47 Billion Dollars per year) carried mainly to expend airports, increase their capacity, set up new airports and ports. The UAE has 18 tour hotels out of the 155 (150 meters high) that exist around the world. This makes the UAE the third destination with such tours after China and America in 2014. These buildings are among the UAE's attraction elements for tourists. Dubai has adopted dazzling ideas in construction and design of these tall tours. The UAE has about 37% of the region's petroleum and gas industries, chemical industries, energy and water and garbage projects. The UAE's government have been injecting huge funds in tourism and real estate projects, especially in Abu Dhabi and Dubai. Al Saadiyat Island in Abu Dhabi and Burj Khalifa in Dubai, the tallest tower in the world, world central near “Jebel Ali” are a point in case of the milestones that have given the UAE its high profile of a global tourist destination. According to 2013-2014 Global Competitiveness Report, the UAE ranked fourth worldwide in terms of infrastructure quality. Dubai Miracle Garden, the world's largest natural flower garden. Masdar City, a zero carbon, zero waste city. ^ a b "United Arab Emirates". International Monetary Fund. ^ "April 2019 MENA Economic Update Reforms and External Imbalances: The Labor-Productivity Connection in the Middle East and North Africa p. 4" (PDF). openknowledge.worldbank.org. World Bank. Retrieved 9 April 2019. ^ "Unemployment rates in UAE are safe for now, economists say". Al-Shorfa. 13 June 2012. Retrieved 3 March 2015. ^ "Ease of Doing Business in United Arab Emirates". Doingbusiness.org. Retrieved 24 November 2017. ^ a b c "GDP to hit $474.2b in 2018". Khaleej Times. 4 July 2013. Retrieved 5 January 2014. ^ "Export Partners of the United Arab Emirates". CIA World Factbook. 2015. Retrieved 26 July 2016. ^ "Import Partners of the United Arab Emirates". CIA World Factbook. 2015. Retrieved 26 July 2016. ^ a b "United Arab Emirates profile". BBC News. 14 November 2012. ^ "UAE History & Traditions: Pearls & pearling - UAEinteract". Archived from the original on 6 February 2016. Retrieved 3 March 2015. ^ "The Hong Kong of the Middle East". Retrieved 3 March 2015. ^ Cuthbert, Jon. "The 40 year history of UAE logistics: Part one - Ports | ArabianSupplyChain.com". www.arabiansupplychain.com. Retrieved 2017-05-10. ^ "Abu Dhabi helps Dubai with bank bailout". Arabian Business. Retrieved 2017-05-10. ^ Editor, Babu Das Augustine, Banking (2017-02-16). "Tough year ahead for UAE real estate market". GulfNews. Retrieved 2017-05-10. ^ a b c d "UAE's economy growth momentum set to pick up". Khaleej Times. 27 December 2013. Archived from the original on 4 January 2014. Retrieved 5 January 2014. ^ "UAE Economy". UAE Embassy in Washington, DC. Retrieved 2016-06-30. ^ "UAE Economy". Retrieved 4 July 2016. ^ "UAE and India sign crucial investment protection pact". Gulf News. 13 December 2013. Retrieved 5 January 2014. ^ "Speaking of Water". Archived from the original on 2011-05-14. ^ "Dubai Drowning in Debt". ^ "UAE Industry Builds Capability". Retrieved 3 March 2015. ^ "Renewable energy across the MENA region : Clyde & Co (en)". Retrieved 3 March 2015. ^ "Masdar City: A Rising Star". The Ecologist. 8 April 2013. Retrieved 3 March 2015. ^ "Trio hope 'fastest snake in desert' is start of UAE car industry | The National". www.thenational.ae. Retrieved 2016-06-01. ^ "UAE foreign trade in figures". Retrieved 4 July 2016. ^ "WTO - Statistics - Trade and tariff indicators". Retrieved 2016-06-30. ^ Mellahi, K. (2007). The effect of regulations on HRM: private sector firms in Saudi Arabia. International Journal of Human Resource Management, 18(1): 85-99. ^ Forstenlechner, I. (2010). "Workforce localization in emerging Gulf economies: the need to fine-tune HRM." Personnel Review 39(1): 135-152. ^ http://www.uaeinteract.com Archived 2010-09-18 at the Wayback Machine. ^ "UAETAW TEEN". UAETAW TEEN. Archived from the original on 22 April 2017. Retrieved 3 March 2015. ^ ":: Emirates Nationals Development Programme ::". Retrieved 3 March 2015. ^ "Indian workers jailed in Dubai over violent protest". Retrieved 3 March 2015. ^ "Welcome to Emirates Foundation". Retrieved 3 March 2015. ^ "Bloomberg". Bloomberg. Retrieved 3 March 2015. ^ "Financial Sector". Retrieved 4 July 2016. ^ "Arab World Competitiveness Report 2013". World Economic Forum. Retrieved 4 July 2016. ^ "Resolution No. (518) of 2009 Concerning Governance Rules and Corporate Discipline Standards"" (PDF). Archived from the original (PDF) on 2016-03-04. Retrieved 2015-11-10. Emirates Integrated Telecommunications Company, commercially rebranded as du in February 2007, is one of the two telecom operators in the United Arab Emirates. du offers fixed line, mobile telephony, internet and digital television services across the United Arab Emirates. The Emirate of Abu Dhabi is one of seven emirates that constitute the United Arab Emirates (UAE). It is the largest emirate by area, accounting for approximately 87 percent of the total land area of the federation. 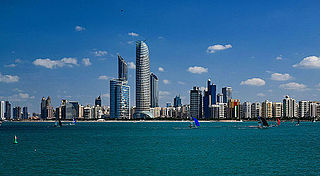 Abu Dhabi also has the largest population of the seven emirates. In June 2011, it was estimated to be 2,120,700 people, of which, 439,100 people were Emirati citizens, which has risen to 2.3 million in 2012. The city of Abu Dhabi, after which the emirate is named, is both the capital of the emirate and federation. The Abu Dhabi National Energy Company, PJSC (TAQA) is a government controlled energy holding company of Abu Dhabi, United Arab Emirates. Australia – United Arab Emirates relations refer to the bilateral ties between Australia and the United Arab Emirates. The UAE maintains an embassy in Canberra whilst Australia has an embassy in Abu Dhabi and a consulate-general in Dubai. Kenya – United Arab Emirates relations entails the diplomatic relations between Kenya and the United Arab Emirates. Kizad or the Khalifa Industrial Zone was unveiled in November 2010 by Abu Dhabi Ports in Abu Dhabi, and officially opened in September 2012. Tanzania– United Arab Emirates relations entails the diplomatic relations between Tanzania and the United Arab Emirates. The UAE is one of Tanzania's largest trading partner and have had cordial relationship for many years. Insurance House PSC (IH) is a Public Stock Company incorporated in the Emirate of Abu Dhabi, United Arab Emirates known for offering Insurance products and services.